I think it's safe to say that we're at the end of the "album age," and although the format will hold on for a while, it's clearly waning in popularity. I've given this a lot of thought and have come up with what I think are the reasons, but be aware, they're not all exactly what the popular wisdom assumes. So let's begin with the 6 reasons why the album format has, for all intents and purposes, died. 1) It was a visual experience. The album format in the vinyl record age had the advantage of that wonderful piece of cardboard known as the album jacket. The album jacket contained the cover art (still found on CDs), and most importantly, the liner notes on the back, which we'll get to in a second. But one thing that everyone either forgets or has never experienced is the fact that millions of albums were purchased completely on impulse because of the album artwork alone! It may be hard to believe, but it was quite common to come across an album cover that was so cool that you'd buy it without knowing a thing about the artist. Sometimes it would be a total loser, but you still had the liner notes to read, and occasionally that would still make it a worthwhile purchase. 2) It was an informational experience too. Those of you too young to have experienced this don't know how much the liner notes meant to nearly everyone who bought an album (the picture on the left gives you an idea how extensive they could be). You could spend hours reading a well-written gatefold jacket, checking out every credit, wondering just where these exotic studios were (Smoketree Ranch in Malibu was the one that always intrigued me the most as a kid), and generally just soaking up any info you could about the artist. Of course, this was way, way before the Internet, so the liner notes were sometimes the only place to find any of info on the artist at all. To say the least, the visuals and information along with the music made buying an album a total experience that today's album doesn't some close to. 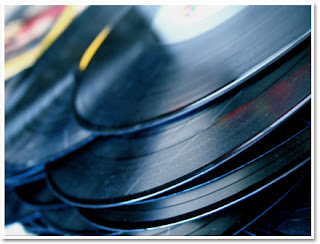 3) The demise of the record stores. Once again, this may seem hard to believe but nearly every community had someplace that sold records, even if it didn't have a record store. There was an entire network set up to supply records to department stores, supermarkets, even diners. You couldn't help but to run into someplace selling records during the course of a day. But the record store was the place to not only buy music, but to spend hours browsing. Why? Because of the cover art and liner notes. You'd peel through a bin of records, stopping every so often to look at an intriguing cover, which made you want to read the liner notes, and maybe even buy the album as a result. But the record store was also the best place for word of mouth. The people that worked the record stores always knew what was hot, what was underground but about to pop, and what was overhyped. You could go into a store and ask a clerk, "What's really good?" and he'd give you 10 choices, most of which were pretty high quality. This is something that the music industry is still looking for today online. Now we call it "music discovery" and VC's still throw big money at anyone who claims to have an app. The greed started in the early 80's as the major record labels were taken over by multi-national companies, the attorneys and accountants ruled, and the prices of the album began to rise - first with what they called "superstar pricing," which tacked on an extra dollar for a superstar act (Tom Petty sued his label keep the price at $8.98, a gesture that would be very unlikely today by a big music act). 5) The CD. Then came the CD, and the business went to hell in hand basket. The packaging was different, so the jacket was no longer needed, and as a result, the cover art became less important, and you couldn't really do extensive liner notes because the print would be too small to read. Then the record labels really got greedy, charging outlandish prices (called "technology charges") on a product that eventually cost them less than the vinyl records they previously were making. In fact, prices soared to $19.95 for a front line artist's CD. If you bought one of these and weren't completely and totally satisfied, you were pissed, since dropping a deuce on anything was a real commitment. And of course, there were no more impulse buys anymore because the artwork behind a 5 inch piece of plastic just doesn't have the same impact as on a 12 inch piece of cardboard. 6) Too much filler. Most vinyl albums are between 35 and 45 minutes long. This was out of necessity because of the physics of a record. Make it any longer and it starts to get noisy, the frequency response suffers, and it won't be as loud. But 40 minutes or so turns out to be the perfect amount of time for listening. There's a time commitment you have to make, but it's well within reason, especially if you like the music. A CD is capable of containing a bit more than 73 minutes of music. Unfortunately, artists began to think that it was a really good idea to put all the garbage that they normally would've tossed from a vinyl record, and put it all on their CD. Now instead of having 40 minutes of great music, we had 55 minutes of mediocrity. Even if the artist had some great songs, it was frequently buried under another 50 minutes of crap. Now not only was the fan paying more money, but she was paying more money for less quality. Something had to give. Which is just about the time MP3's and Napster came on the scene, which eventually helped push the music business from an album business into the singles business that it has now become. Ironically, popular music started with as a singles business, to whence it now returns. It's easy to say that online music slayed the album, but it was only the final dagger after 6 long swords. The web site theneverendingstage.com say's Thumbs up to this article! I think the company's that can bring back the record player, 45's, records, vinyl, while providing some of the new things would stand to make a hefty buck! Informative article!